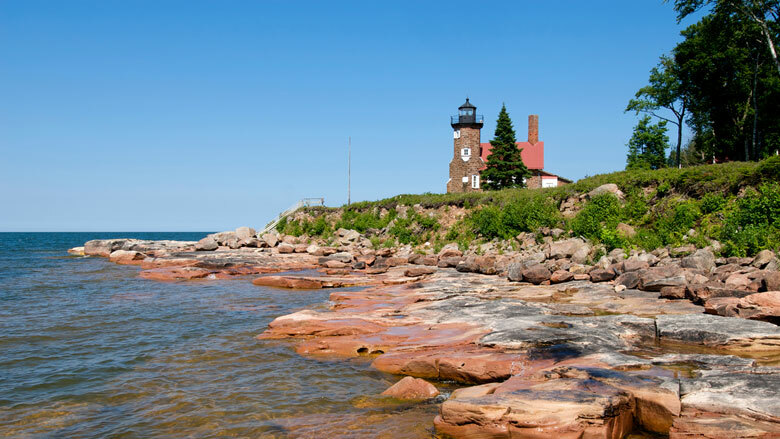 Located on the northern tip of Sand Island, the Gothic-style Sand Island Light is one of nine historic lights spread across the Apostle Islands National Lakeshore. Remembered today for his unyielding commitment to conservation, U.S. Senator Gaylord Nelson of Wisconsin championed these remote, forested islands becoming part of the National Park System. His hope was to protect their undeveloped shorelines, red sandstone cliffs, windswept beaches, and protected anchorages for public use and from overdevelopment. The Apostle Islands joined an impressive list of unique and well-loved places set aside, beginning in 1872, for protection, public enjoyment, or scientific interest. However, a unified system to manage and protect these places did not actually come about until 1916. So today, in 2016, we celebrate one hundred years of the National Park Service and reflect on how it has evolved and adapted to new challenges and expectations—including those at the Apostle Islands—as our nation has grown and changed. This sudden plash into pure wildness—baptism in Nature’s warm heart—how utterly happy it made us! Nature streaming into us, wooingly teaching her wonderful glowing lessons, so unlike the dismal grammar ashes and cinders so long thrashed into us. Here without knowing it we still were at school; every wild lesson a love lesson, not whipped but charmed into us. Oh, that glorious Wisconsin wilderness! Moving west in his early 30s, Muir spent most of his adult life in California. He wrote frequently in the popular press about American wilderness and advocated for the federal protection of wild lands with special scenic and educational value. He was directly involved in promoting the establishment of Yosemite, Sequoia, Mt. Rainier, Petrified Forest, and the Grand Canyon as protected areas. Many suggest that in 1903 when Muir and President Theodore Roosevelt camped together briefly in Yosemite, Muir convinced the president the federal government (rather than individual states) could best protect the nation’s exceptional forests and sublime landscapes from those who would exploit and destroy them. At the time Muir and Roosevelt met there were only eight national parks designated by Congress and protected through a variety of arrangements under the Department of Interior. The authorities were similar for most of the other new national parks. In some cases, such as at Wind Cave National Park, the Secretary was directed to issue regulations necessary for the care and management of the park without further sideboards. But the Department of the Interior was provided little or no funding for field staff, and the new national parks were protected in name only during the early years. U.S. Army troops, in fact, were assigned to protect Yellowstone in 1886 and provide some order, and soon the Cavalry were assigned to three of the other early parks as well. It’s been said that the Army “saved the national parks,” as they apprehended poachers and livestock grazers, fought forest fires, and even began the first naturalist programs. In 1916, two years after Muir’s death, the Progressive-era Congress passed—and President Woodrow Wilson signed—the National Park Service Organic Act, which created a new federal bureau to manage the growing number of national parks. The law gave the agency a lyrical mission “to conserve the scenery and the natural and historic objects [of the parks] and the wild life therein and to provide for the enjoyment of the same in such manner and by such means as will leave them unimpaired for the enjoyment of future generations.” Reading this even today evokes the majesty of Yosemite, the beauty of the Grand Canyon, and the mystery of Mesa Verde. And, for those who know, the tranquility of the Apostle Islands of northern Wisconsin. Stephen Mather, the first director of the fledgling National Park Service, was an astute marketer who recognized that the parks needed public support to be successful. Mather aligned the National Park Service with the railroads and the nascent auto associations to promote the parks as travel destinations, and he personally bankrolled publicists to lobby Congress for support and to generate enthusiasm in the popular press. He and Horace Albright, Mather’s deputy and later his successor as Director, both saw the benefit of extending the National Park System to the East, closer to the majority of the population—and to the elected leaders who controlled their budget. They oversaw the establishment of Great Smoky Mountains National Park in Tennessee and North Carolina, and Shenandoah National Park in Virginia, just 90 miles west of the nation’s capital. In 1933, President Franklin Roosevelt invited Director Albright to accompany him on an excursion to inspect the new Skyline Drive at Shenandoah, then under construction. Just as Muir had made a compelling case for preservation of natural areas to the first Roosevelt, Albright suggested to the second Roosevelt that all of the nation’s protected historic sites and battlefields should be managed by the National Park Service rather than the U.S. Forest Service and the War Department, which then controlled many. Roosevelt readily agreed and shortly thereafter issued an Executive Order—which Albright drafted—transferring responsibility. Overnight the National Park Service became the nation’s unquestioned historic preservation agency, doubling the number of sites under NPS management. The first stirrings of a national park in Wisconsin began three years before the conversation between Albright and Roosevelt that doubled the size of the National Park System. The Apostle Islands area had seen the beginnings of a tourist industry in the 1890s, when well-to-do hay fever sufferers from Omaha began to build summer cottages on Madeline Island. But the Depression saw the closing of the last of the local sawmills, mines, and luxury hotels in the area, and there was little economic activity. Responding to local boosters interested in re-invigorating the tourist economy, the NPS sent Boston-based landscape architect Harlan Kelsey to visit the islands in 1930 to evaluate their suitability for a national park. What must have been once a far more striking and characteristic landscape of dark coniferous original forest growth has been obliterated by the axe followed by fire. The ecological conditions have been so violently disturbed that probably never could they be more than remotely reproduced. … The hand of man has mercilessly destroyed [the islands’] virgin beauty, and, therefore, a largely controlling element as outstanding national park material even if other reasons made them eligible. Kelsey’s negative report is particularly ironic in three ways. First, Virginia’s Shenandoah and Michigan’s Isle Royale National Parks, both established in the 1930s, were at least as cut-over as the Apostles were, and, due to their greater topography, more eroded. But Shenandoah was created with the explicit goal of restoring natural conditions and Harlan Kelsey was one of its greatest advocates. Second, by that time, the National Park Service had developed criteria for new national parks that, like today, favored exceptional scenery and uniqueness and discouraged sites that replicated what could be found in existing national parks or might better be managed by state or local authorities. Yet Congress, then and now, is the arbiter of what enters the National Park System. Creating an economic boost for a distressed economy has always motivated Congress when it comes to national park establishment. Last, Kelsey foresaw, and was discouraged by, the logistical challenges of managing a national park in the Apostles, noting that, due to the dangerous conditions often prevailing on Lake Superior, “reasonably large boats would be required for safe operation of traffic between the islands” and that the islands would be inaccessible for many months of the year. On that score he was prescient, and the logistics and high cost of operations at the Apostle Islands National Lakeshore certainly challenge the NPS today. As time passed, the forests regrew and the beauty of the islands returned. The national park idea in the Apostles did not die, but it took until the 1960s to grow roots deep enough to bloom. Gaylord Nelson, the former Wisconsin Governor who became a U.S. Senator, had been exposed to the islands as a boy. But many credit a gruff and unassuming northern Wisconsin conservationist named Martin Hanson with suggesting to Nelson that the islands should again be considered for national park status. A master of “gentle pressure, relentlessly applied” (of which I was a regular recipient in his later years! ), Hanson influenced the newly-elected Senator Nelson to propose to President John F. Kennedy a national conservation tour in 1963 to highlight environmental issues and recreational development. Suddenly, Kennedy was interested; what he didn’t know was that Hanson had spread the word that as many sailboats as possible needed to be out that day so that the President, an ardent sailor in his native Cape Cod waters, would see them. It took seven more years before Senator Nelson’s bill to create the national park in the Apostle Islands would pass both houses of Congress and receive President Nixon’s signature. It was a bipartisan effort across three Congressional terms, championed in the House by Republican Congressmen Alvin O’Konski and Bob Kastenmeier, also from Wisconsin. I became Superintendent of the Apostle Islands National Lakeshore in 2002. The very next year, I had the opportunity to take a frail-looking Gaylord Nelson on an NPS boat to one of the islands with a Wisconsin Public Television crew that was making a documentary film about his life. Filmmaker Fred Wessel and I encouraged Nelson to wax eloquent about the conservation and ecosystem values of the park, hoping his words might mirror the language we often use to describe the value of the park. Nelson wouldn’t do it, though. He spoke of open space protection, scenery, and the value of undeveloped shorelines. Nelson’s vision of the park, formulated in the legislative and political trenches of the 1960s, was, surprisingly, quite different from my view of what the park had become. The value we place on these parks today is perhaps greater—and deeper—than the hopes and dreams of those who fought to establish them. We’ve matured from protecting scenery, open space, and historic objects to preserving plant and animal communities, essential ecosystems, and wilderness. As we better understand the interdependence of people with these landscapes, we’ve also grown to appreciate the latter’s capacity for, in the words of University of Wisconsin–Madison environmental historian William Cronon, “rewilding.” The significance of each national park grows with time, the better it is known, the more it is studied, and the more it is loved. Nelson, for example, was not especially interested in the human history of the islands. Yet today, in cooperation with the local Ojibwe tribes, the NPS works to interpret the centrality of the islands to American Indians past and present. The legislative history of the park also shows scant mention of lighthouses, fisheries, 19th century quarries, or Native American cultural sites. This is despite the passage of the National Historic Preservation Act in 1966, four years prior to the park’s enabling legislation, which created a mandate for the NPS to inventory, assess impact on, and, where feasible, preserve nationally significant prehistoric and historic resources under our care. The seven historic Light Stations in the park were actually not added to the preservation mandate until years after the original bill passed, and were not a factor in the creation of the park. Yet today, these iconic lights—along with the sea caves and beaches—are what visitors report they most like about the Apostle Islands National Lakeshore. Professor Mark Sagoff, then at the University of Maryland, asked the question in a 1995 presentation to National Park Service resource managers: Is the NPS protecting resources or places? Places may have ecological, scientific, historic, or economic components (perhaps the objects mentioned in the 1916 NPS Organic Act) but their significance is in what they represent intellectually and emotionally. Therefore the value of wild, natural places is, curiously, largely cultural. The primary reason the Apostle Islands were set aside was for the purpose of preserving scenery and open space for recreation, with high hopes of economically rejuvenating the area. The park is now recognized for its ecological integrity, significant maritime history, and spiritual and subsistence value to the Ojibwe people past, present, and future. Yet Nelson wasn’t wrong: the park’s greatest value to people is probably, still, its offerings of scenery and open space that the NPS strives to conserve unimpaired, as the one hundred-year-old law still directs. The country has changed in countless ways in the last one hundred years. Are the national parks timeless, or should they adapt to changing times? Are the values of the national park system enduring, such that we should seek to pass them on unchanged to each generation, or should each generation be encouraged to find its own values in the system? The NPS wrestles with these questions; but we believe the answer to each is nonetheless yes—but with some obvious tension in balancing disparate philosophies. Despite our best efforts, we probably can’t conserve the parks absolutely unimpaired. So there’s both the reality and risk of what we call shifting baselines. For example, do today’s visitors to Everglades National Park recognize that, despite the magnificent birdlife the park is renowned for, the park supports 90% fewer nesting birds today than it did in the 1930s? And that if it were not for the largest and most complex ecological restoration program in the National Park System, things would be worse? We’ve actually turned the corner at Everglades. It’s frequently said in South Florida that the Everglades is a test. If we pass this test, we may get to keep the planet. Back in Wisconsin, how many of today’s visitors to the Apostle Islands know that the NPS has intentionally culled almost all of the white-tailed deer on two islands in order to preserve the native Canada Yew understory that’s been eliminated by deer almost everywhere else in Wisconsin? As different as Everglades and Apostle Islands may be, both of these national parks—and all national parks—require that we apply the best possible science to understand, and, where appropriate, actively manage their ecosystems to protect and restore them. To paraphrase ecologist Lisa Graumlich, Dean of the College of the Environment at the University of Washington, it’s no longer sufficient to simply put a fence around national parks and assume they’ll persist in good condition for those future generations. Parks need well-educated, informed, passionate advocates who believe they are important touchstones for what we value as Americans. Public support—and ultimately political support and sustainable funding—for the National Park System requires that the Service remain relevant to Americans as the country changes. That’s one reason for the growth of the System—national parks are now in all fifty states—and Mather’s concept of bringing parks to where the people are has blossomed with the huge expansion of the national park system into urban areas and the addition of parks that preserve and interpret a much wider array of American stories. In recognition of the need to remain—or perhaps, become—relevant to an America whose demographics are rapidly changing, the official NPS centennial goal is to connect with and create the next generation of park visitors, supporters, and advocates. The national parks have inspired past generations of Americans who have loved and supported the parks and the National Park Service. For the System to thrive, both have to continue to inspire. A visit to a national park is memorable precisely because these are special places. But a wise mentor of mine once said that we should do our best to help people understand that the national parks also need their support the 51 weeks of the year that they don’t visit. This means supporting the park rangers, biologists, historians, and other staff in our stewardship and educational work who do the science, maintain the trails, and encourage the personal connections. Park rangers are the protectors and educators, but at the same time they really are the friendly people in the Smokey Bear hats that every kid wants to be when he or she grows up. At the Apostle Islands National Lakeshore we are celebrating the National Park Service centennial by looking both backwards and forwards, honoring the past and trying to make new connections that will inspire long into the future. A recent internal review of the NPS’s management policies advised that we “steward NPS resources for continuous change” if we are to adapt to a rapidly changing world in which the extent of commercial and residential development outside park boundaries, shifts in technology and demographics, and global climate change would have been inconceivable a hundred years ago. The good news is that the Apostle Islands and Lake Superior don’t need a lot of elaboration. However, climate-driven changes to water temperature and the extent and duration of ice cover are already dramatic, and we can expect these changes to ultimately (if slowly) cause range shifts in the plants and animals that define the park ecosystem. Unquestionably the Apostle Islands will look different a century from now as a result of climate change. Unlike in some other portions of the country, here in Wisconsin our park neighbors and visitors care deeply about the lake and this place, supporting the park staff’s highly visible efforts to be out front on climate change and sustainability. Other threats to the park’s future are less subtle. Though it consists primarily of islands many hours from the nearest population center, it is not as isolated from the larger world as first impressions suggest. Developmental pressures in the watershed such as the Penokee Range iron mine—currently on hold—and the largest confined animal feeding operation ever proposed in the state—under evaluation by the Wisconsin DNR for an operating permit—pose a real risk to water quality, and, by extension, the fishery and even the recreational experience of the area. It’s critical as we enter the second century of the National Park Service that we be involved in the public discussion, encouraging thoughtful decision making by others that weighs risks and benefits—not just to the park, but also to those quality-of-life values, and possibly even to the economic engine that the park has become. The world is more complicated now than it was when the NPS was born in 1916, or 1970, the year the Apostle Islands National Lakeshore was established. Our task today, with increasing urgency, is to keep (or make) the park relevant to both current and future generations, and to people of every demographic stripe, including some who don’t yet know the park is there for them and waiting for their engagement. For some, it’s beauty or recreation, or, as FDR said, “re-creation.” For others, it’s ecological integrity or historical authenticity, or wilderness. If they can find their park here, the Apostle Islands National Lakeshore will remain and thrive, despite the changes, to celebrate the NPS bicentennial a hundred years from now. Bob Krumenaker began his National Park Service career in 1977 as a volunteer in Utah. He became superintendent of Apostle Islands National Lakeshore 25 years later.